In the bowl of a stand mixer, combine brown sugar and butter and beat until smooth. Add in eggs one at a time. In a small saucepan, heat milk and water until lukewarm to the touch; add to batter. Add cinnamon, salt and yeast and mix together with paddle attachment. Remove paddle attachment and replace with dough hook. Add in two cups flour and knead with dough hook. Continue to add one cup of flour at a time until dough begins to look shaggy and pulls from the sides of the bowl. Place dough on counter and knead 8-10 minutes, adding more flour as needed to keep it from being sticky. Dough should end up soft and smooth. Place dough ball in a greased bowl, turning to coat, and let rest one hour or until doubled in bulk. In the meantime, mix together brown sugar and cinnamon for the filling in a small bowl. Place the risen dough on counter and roll out into a 12 x 18-inch rectangle. Spread melted butter for the filling over the rectangle and sprinkle brown sugar-cinnamon mixture evenly on top. Fold over shorter sides one-inch in and roll lengthwise into a jelly-roll shape and pinch seam closed. Cut into 12 pieces with a very sharp knife. Place pieces on a baking sheet lined with parchment paper. Cover and let rest 30 minutes until slightly puffy. Preheat oven to 350°F. Bake rolls for 20-30 minutes until slightly brown. Cool on wire rack. I remember the first time I had a cinnamon roll. It was not a good experience. Straight from a package, it was the store-bought kind, and therefore incessantly sticky and gooey and flat. The cream cheese glaze was more of an overly sugary vanilla frosting, and the dough was chewy instead of light and airy. I was not impressed. Needless to say, the first time I had a homemade cinnamon roll, I had quite a different experience. There's really nothing like homemade cinnamon rolls -- though they often aren't as pretty as the store-bought kind, they taste loads better, and don't even need that sugary glaze atop them to make them delicious (though it doesn't hurt, I'm sure). What I especially loved about these cinnamon rolls was the smell they diffused throughout my kitchen. 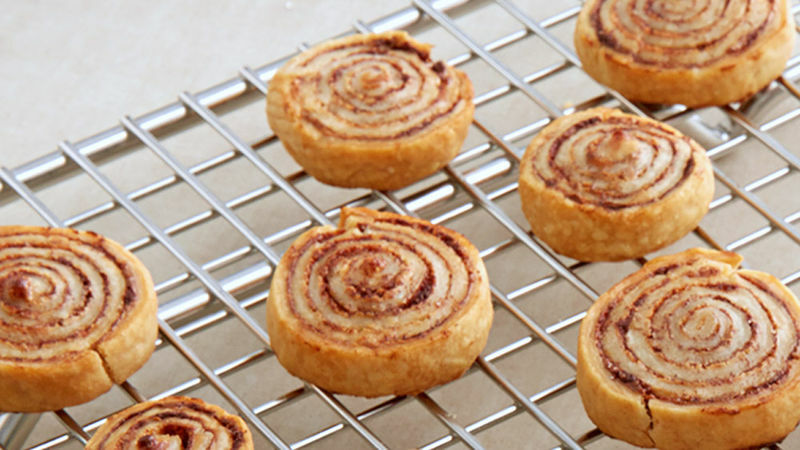 A warm, Snickerdoodle swirl of brown sugar and cinnamon flavor wafting from my oven made our whole home smell like it should on a special occasion. And it wasn't a special occasion, apart from the fact that I made cinnamon rolls. That was a pretty big deal. A note of caution on these rolls (OK, two, actually): Make sure they are spread far apart on the baking sheet(s) before letting them rise the second time. I made the mistake of squeezing all 12 rolls on one small baking stone with no lip and, while they were baking, I started to smell burning sugar and watched smoke coming from the top of the oven. They had expanded even further in the oven and began to melt over the edges of the baking stone. With some quick thinking I managed to save most of them, but they could have turned out much prettier if I had given them some breathing room. Note of caution number two: These are dang good. So be prepared to eat more than one at a time.